Porcelain veneers available at Karalee Family Dental near Ipswich are an ideal cosmetic dentistry solution to enhance your smile. Porcelain veneers are thin porcelain shells that can be used to restore stained, chipped, cracked or crooked teeth along the front of your smile. Porcelain veneers are custom made and can be moulded and shaped to the natural appearance of your tooth so your smile appears as natural as possible. Custom made from porcelain materials, this cosmetic dentistry treatment is designed to provide a strong, long-lasting and aesthetically pleasing cover for the teeth in the ‘smile-zone’. The smile-zone refers to the teeth that can be seen when you smile. What are porcelain veneers most commonly used for? Can veneers fix crooked teeth? Veneers can resolve minor alignment problems and cover gaps between the teeth. They are often considered a fast alternative to braces, however if the patient needs bite correction or complex orthodontics, the treatment may not be suitable. Who is suitable for porcelain veneers? During your consultation appointment with Karalee Family Dental we will assess your smile and discuss your needs and desires with you to ensure the treatment is appropriate for you prior to the commencement of your treatment plan. Unlike regular teeth, porcelain veneers cannot be whitened with teeth whitening products. During our consultation we will discuss with you the best shade for your teeth. You can make your veneers white without causing them to look fake or unnatural. Often times, patients will have their other teeth whitened before undergoing their porcelain veneers treatment so that their other teeth are the same shade as the veneers. After your consultation your dentist will need to prepare the teeth for the porcelain veneers. This will involve the removal of some of the tooth’s enamel. Once this is complete, your dentist will take an impression of the teeth and this will be sent to a local Australian laboratory where the porcelain veneers are made. Because the laboratory is local, we can better guarantee the quality of our work. During this waiting period you may prefer to have temporary veneers placed. 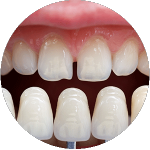 Once the veneers have been fabricated, your dentist will carefully bond them to the teeth. Your dentist can adjust the shade and shape of the veneers during this appointment until they are in line with your aesthetic desires. For more information, contact our team at Karalee Family Dental. Porcelain veneers are longer lasting than composite veneers. When taken care of properly, porcelain veneers tend to last 7-10 years on average. Veneers, like regular teeth, are still susceptible to damage. It is important that you follow a regular hygiene routine and brush twice a day, floss daily and visit the dentist every 6 months for check-ups and cleans. During your check-up visits at Karalee Family Dental we will assess the health of your teeth, gums, bone and the condition of your veneers. We will provide you with advice on technique and make sure all your concerns and questions are answered prior to your treatment appointment and during every appointment at Karalee Family Dental after. Find out more about the cosmetic dentistry treatments available at Karalee Family Dental near Ipswich, QLD by booking a consultation with our friendly and welcoming team today.